2018 has arrived! It is raining in California, which hopefully means my brown grass will change to a nice shade of green. And more importantly, that NW wind will start blowing so that I can do some downwinds! 2017 went by in a flash, and I have sadly realized that the older I get, the faster time flies. Staying focused these days is tougher than ever, the addictive nature of social media and the increased access to information seems to derail any well planned day! Leaving behind the rigidity of an Olympic Training Schedule, and having the “freedom” of working for myself again, has definitely tested my self restraint and discipline in new ways. My 2018 resolution is to have more “real” time, face-to-face conversations, genuine friendships and be more resistant to distractions. Mostly just be better than I was yesterday! Some highlights of the past year: Opening a new business – Paddle California, which aims to spread the stoke of surfski by growing paddling sports in California, and around the world! We aim to achieve this through world class coaching and education, laying the foundations of great technique for beginners, and providing the worlds best (and self-tested & approved) equipment. We are the West Coast importers for Nelo, and a total highlight was exceeding our hopes by bringing in 3 containers for 2017! Seeing the Florida Keys (and enjoying a couple days off after some Olympic Presentations and Coaching Workshops). Being back in my home country South Africa for the Canoe Marathon World Champs (not our best race but always good to line up with the fastest in the world). And of course seeing our buddy Jenny Egan go on to win a medal! Been training with her since she a lightee! And of course doing a few Miller’s Runs (with all the internationals post-marathon worlds). 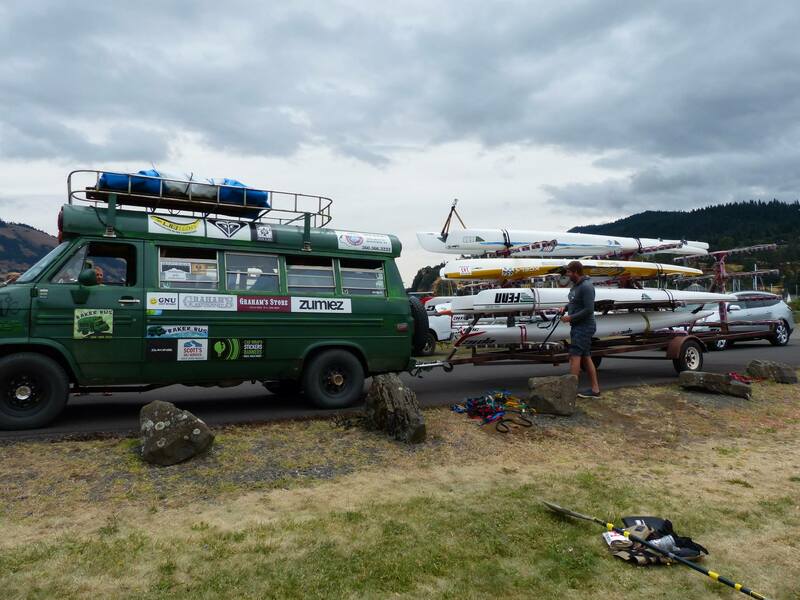 Paddle California got a VAN! Spent many hours fixing it up to be the perfect mobile office/delivery vehicle and of course surf trip camper! And finally, went to Hong Kong for the ICF Surfski World Champs. Not my best day out, battled in the flat water (the wind did not come through as hoped) and never really felt good. The wind came through the next day for possibly one of the best downwind competitions for the men’s race, kind of felt a little (LOT!) cheated by the weather gods! After missing 6 months of water time with a torn tendon, my base was only really starting to come back, but definitely needed the downwind if I was ever to be in contention. A bittersweet end to the year’s racing. Looking back is always fun and it reminds me of how fortunate I am to live this life. I am super excited about 2018, and all the fantastic plans we have for Paddle California and some last gasp racing related travel planned! Thanks for reading and all the best for 2018! Well that was a long break from posting! The year sure has flown by. I have so much to be thankful for. After the excitement and intensity of the Rio Olympics, I took a few months to travel – in South Africa – and used the time to set up my next venture – Paddle California. I started the business just over a year ago with Maggie Hogan, who I had the privilege to coach leading into Rio. Our main goal through Paddle California is to bring the stoke of paddle sports to more people. California, and in particular, Southern California where I am now based, has so much water opportunity, and to see the sport grow here would be awesome! With LA2028 around the corner, there is a lot of good vibes around bringing the Games back to the area, and SoCal is the perfect place to train year-round. We are the West Coast dealers for Nelo (world class kayaks, canoes and surfskis), Knysna Racing Paddles, Gara Racing Paddles, Mocke Paddling gear, Downwind gear, Vaaka and Funky Pants. We also coach both in person at our Paddling Workshops, from our home base in SoCal, and via our remote Online Training Plans. We have a few exciting ideas in the pipeline, so watch this space! Check out www.paddlecal.com for more info. We also started a surfski school program out of the Newport Aquatic Center, and are loving introducing new people to the sport! After a 6 month break dealing with an elbow injury, I have managed to get some training going again, and my main race for the year being the ICF Surfski Worlds in Hong Kong in late November. These past few weeks have been a whirlwind of travel! 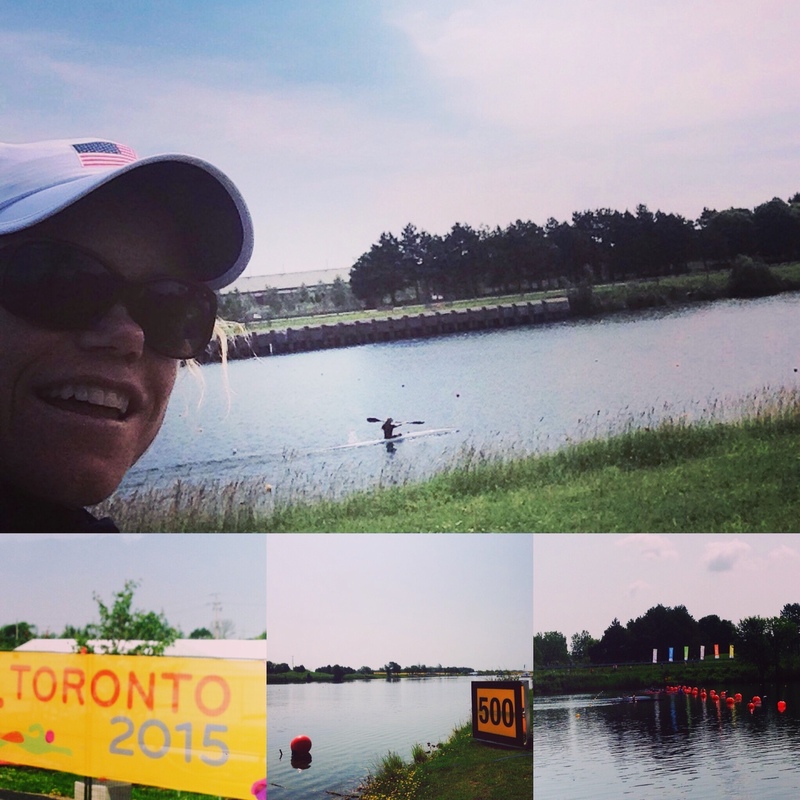 I left Oklahoma City with Team USA to travel to Toronto for the Pan American Games on July 5th. With a relatively small team to look after, I still had my hands full. It’s been an adjustment to move to “the other side”, but in a way it is a lot more rewarding looking after others than yourself, and I am fully enjoying the transition on the sprint side. My multi-tasking skills are improving too, as noted by above photo taken while cycling, timing and coaching! 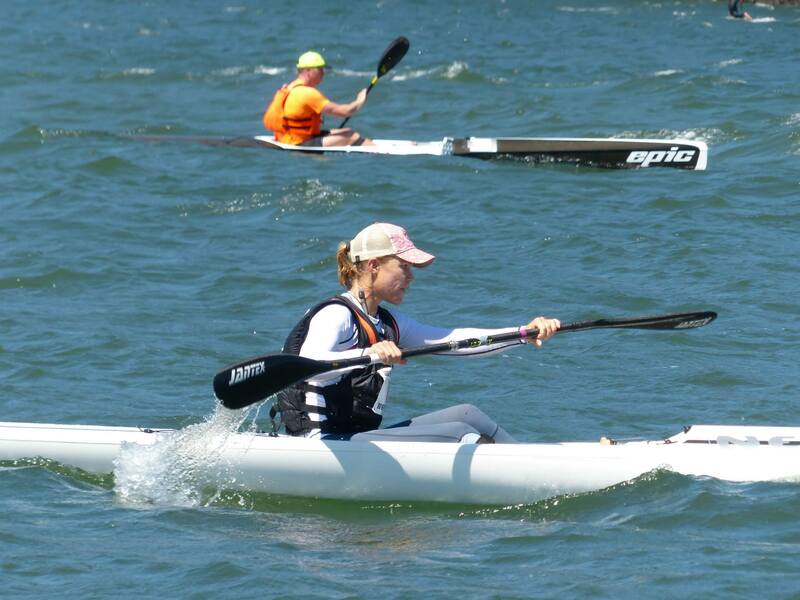 I unfortunately missed the 1st of the surfski races, the Canadian Champs, and instead headed straight to Hood River for the Gorge Downwind Festival to race 2 events – the North American Championships and the Wild Side Relay. What an amazing venue for a race (or a holiday!) The river is warm, and the wind blew every day. It’s a strange sensation to be doing a downwind, on a river, against the flow, and in fresh water! I had a great race, taking the lead about 2km in. Teneale Hatton (NZ) took a shallower line, and was a little behind me most of the way. I hit the last 3km, the wind died a little, and the runs went flat. Having the world’s fastest 1000m paddler hunting you down is a little daunting, and with about 1km to go she caught and passed me! Well done Teneale! The standard of the women’s event was nice and high, with some internationals making the trip out, including 2 Kiwi’s (Teneale and Rachel), an Aussie (Rowy), a South African (Samantha) as well as some local US Paddlers (Maggie). There is nothing better than seeing growth not only in numbers but depth of talent too! Let’s keep the momentum girls! On the 2nd last day, I teamed up with Maggie Hogan to do the Wild Side Relay, which consisted of 4 legs of roughly 8-10km each. The second leg I did took me through some of the best runs I had all week, in a section called Swell City! A great concept for a race, and one of the few events that utilized their wind window. Unfortunately I left Maggie with the last leg, a real slog with no wind! She pulled through and managed just fine though! 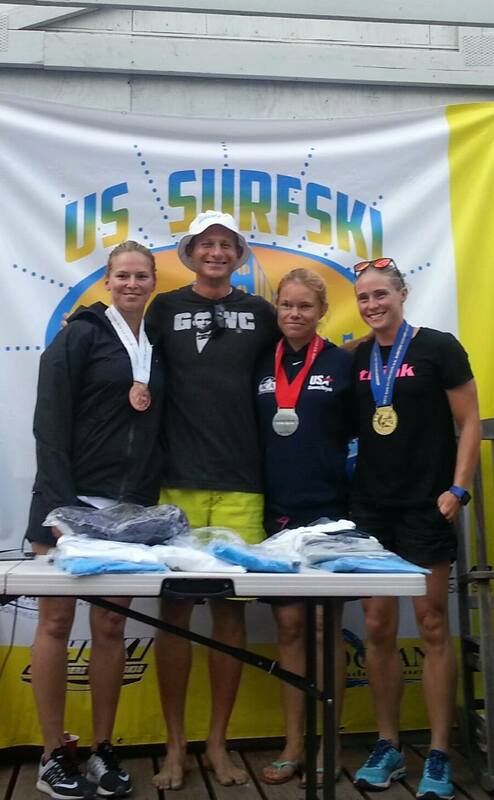 After spending a few days in San Diego at the USA Canoe Kayak Sprint Nationals, put on by the San Diego Canoe Kayak Team (well done Cathy and your team! 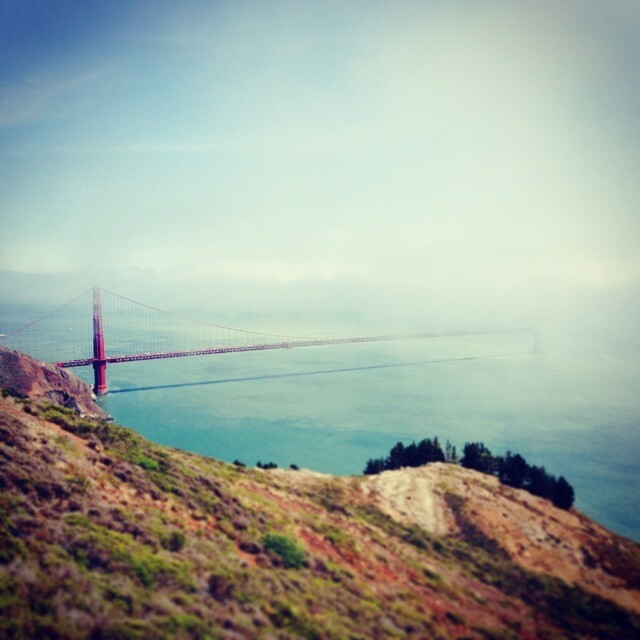 ), I flew into San Fransisco on Saturday morning, ready for some Golden Gate action! Unfortunately no real wind at the start, although it was sunny and hot! Can’t have it all right? Teneale rocketed off the start line, showing us how it is done! The current was crazy as usual, and I am not sure if my line was correct. Once under the iconic Golden Gate Bridge, we went South of Alcatraz, for the first time since I’ve done this race. The runs were fantastic around the island, followed by a bit of a flat spot. Once through that section, it was runs all the way into Berkley. I seemed to be gaining on Teneale, but she was just too strong for me to catch her! The women’s field again nice and solid, with Rachel in 3rd, Maggie in 4th and Rowy in 5th. 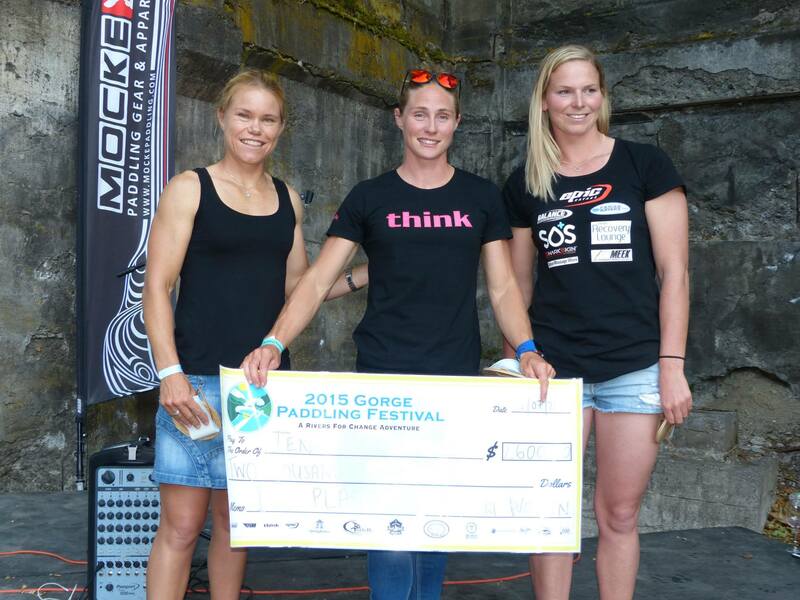 Next up is the Nelo Summer Challenge followed by the 2nd ICF World Champs in Tahiti. With the rest of the world going, it’s looking like it will be one epic race! Leading up to the US SurfSki Champs in August, Pat Langley of Vaikobi was so kind as to send me a pair of the V Cold Paddle Pants. I remember as a kid being able to surf for hours in just boardies, but somehow as I’ve got older, there seem to be an increasing about of thermal tops being added to my paddling gear collection. I pulled them on for the first time on a reasonably chilly and windy day, and immediately felt the warm factor. I took this as a great sign, and by the time we had hopped on the water for a quick downwind run from Fort Baker to Berkeley, I was looking forward to the cool water. If anyone has paddled in San Francisco they will know that the water is always pretty cold. As Mark Twain said “The best winter you’ll ever have is summer in San Francisco!” The pants kept me nice and toasty, and even though I went pretty hard in the paddle, I never over-heated. The breath-ability and temperature management systems of the pants works a charm. They were surprisingly comfortable, as I was expecting the neoprene to cause a bit of resistance to movement in the seat as I rotated with the paddle stroke, but the cleverly designed panels of different material make these pants fantastic with regards to range of motion. 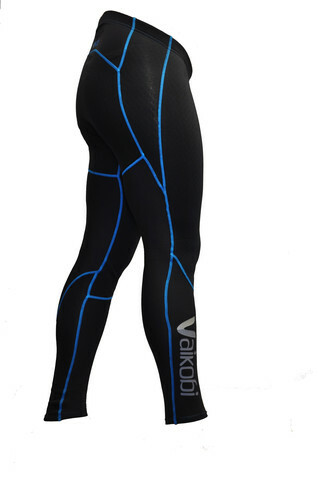 They are pretty stretchy and the low front and high back is perfect for a seated sport like surfski. (I also like the blue seam lines effect-no chafing and make the pants look pretty cool too). All in all, these are now my favourite pants to paddle in. With winter settling in properly in Oklahoma City, they are coming in handy in my K1 as well. As it’s said – “there’s no such thing as cold weather, just poor gear”! Click on the logo below or the images of the pants above to go to the Vaikobi website to find out more. 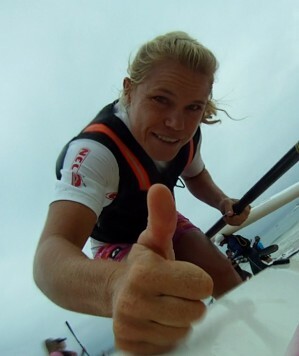 a training day in Plett from Michele Eray on Vimeo.